The resort of Hanalei Bay offers a fabulous tropical escape with views that are absolutely heavenly. Enjoy the picturesque beaches, spectacular golden and crimson orange Hawaiian sunsets and famous multicolored Hawaiian rainbows from the convenience and comfort of your personal lanai. Gaze out over a pristine sparkling ocean vista and take in the splendor of the breathtaking Namolokama mountain range and Bali Hai, the mountain peak made famous by the movie South Pacific. Relax beneath a gently swaying palm tree while enjoying soft Hawaiian breezes. 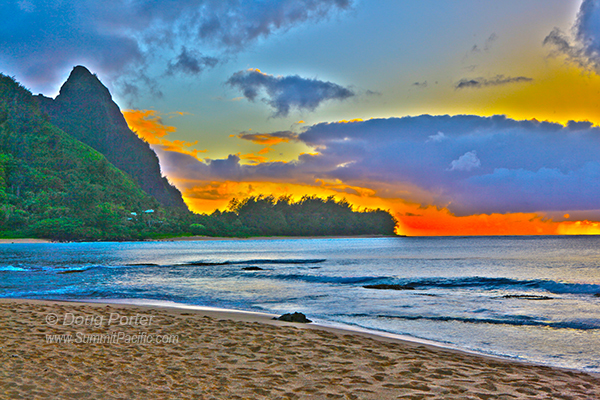 Kauai is rated as having some of the best beaches in Hawaii. There is so much here for beach and water lovers. Take a walk on soft white sand that stretches for miles on a crescent beach. Thrill to the crystal turquoise multicolored blue water. Enjoy snorkeling, swimming, kayaking and wind surfing, along with some of Hawaii's premier surfing opportunities. Lovers of this gorgeous tropical Hawaiian paradise enjoy hiking and horseback riding found at nearby Princeville Stables. Taking a waterfall tour by horseback provides fond memories that last a lifetime. Enjoy riding on a zip-line for a unique new adventure. Play an exciting tennis game on one of the eight spectacular tennis courts. Visitors love the wealth of activities available at Hanalei Bay Resort. Next door to beautiful Hanalei Bay Resort is a 45 hole championship golf course. This popular course is one of the most famous golf courses in Hawaii. Consistently ranked as one of the top 100 golf courses in the United States, this challenging and scenic course offers spectacular golf opportunities for everyone. 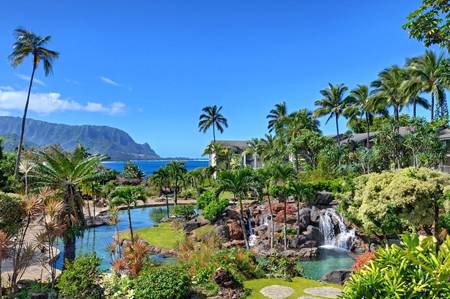 Enjoy some of the best accommodations available in Hawaii at the beautiful Hanalei Bay Resort. Modern amenities and a stylish tropical decor make this a relaxing escape for visitors to beautiful Kauai. Luxurious, spacious condominiums offer the best in classic accommodation. In the warmth of a glowing Hawaiian evening or in the bright sunshine of sun-kissed daylight visitors love relaxing in one of the most beautiful pools in Hawaii. This award-winning lava rock and waterfall pool found at Hanalei Bay Resort features scenic views, pool side massage and a hot tub with a unique sandy bottom. After a fun and exciting day in Hanalei Bay, visitors are thrilled to find over 30 wonderful restaurants including the famous Hanalei Pizza. Delicious food is served in a variety of wonderful choices, along with world-famous Hawaiian hospitality. Thrill to the warmth and spirit of Aloha shown by the Hawaiian people in memorable Hanalei Bay.